Apple just went a long way towards calming iPhone 8-related fears. 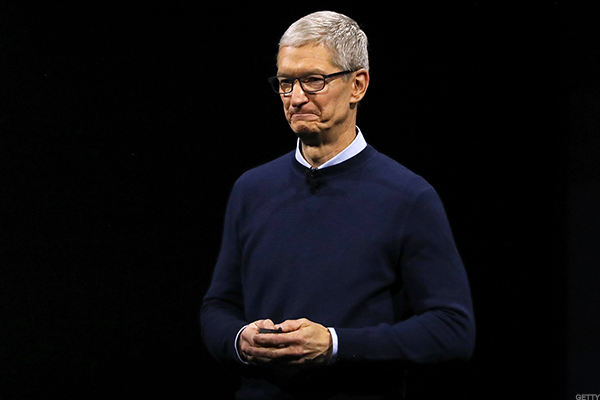 For a quarter for which sales expectations were depressed, Apple Inc. (AAPL - Get Report) soundly beat estimates with the help of an impressive turnaround for a long-pressured business. And for a quarter for which fears have been running high that iPhone 8 production delays would crimp sales, the company issued an outlook that went a long way towards calming such worries. With shares having barely budged since the company's last earnings report and (in spite of big early-2017 gains) still trading at moderate multiples going into earnings, that was a recipe for a sharp move higher. One that possibly isn't finished. Apple reported June quarter (fiscal third quarter) of $45.41 billion (up 7% annually, or 9% in constant currency) and GAAP EPS of $1.67 (up 18%), beating consensus analyst estimates of $44.89 billion and $1.57. It also guided for September quarter revenue of $49 billion to $52 billion, up from $46.9 billion a year ago and largely above a $49.2 billion consensus. Shares rose 6.3% after hours to $159.50, and made fresh highs. They're now up 37% on the year. iPhone/iPad suppliers also got a boost: Cirrus Logic Inc. (CRUS - Get Report) rose 4.2% to $65.70, Skyworks Solutions Inc. (SWKS - Get Report) rose 3.1% to $107.50, Qorvo Inc. (QRVO - Get Report) rose 2.7% to $69.90, Jabil Inc. (JBL - Get Report) rose 1.2% to $30.78 and Broadcom Ltd. (AVGO - Get Report) rose 2.8% to $255.40. iPad sales were easily the biggest surprise in the report: After having dropped 12% annually in the March quarter, iPad revenue grew 2% to $4.97 billion, trouncing a $3.95 billion consensus. Unit sales rose 15% to 11.4 million, reversing the March quarter's 13% drop and ending a very long string of annual declines. As the gap between unit and revenue growth drives home, the iPad turnaround wasn't driven by the high-end iPad Pro line, which Apple refreshed at its early-June WWDC conference and which it has been heavily promoting as a notebook substitute. Rather, it was driven by the mid-range tablet -- simply called the iPad -- that the company launched in March. Though its specs are marginally inferior to those of the iPad Air 2 it replaced in Apple's lineup, the iPad's $329 starting price also makes it $70 cheaper, and it looks like that provided a big sales boost. Education market buyers, many of whom have embraced Alphabet Inc./Google's (GOOGL - Get Report) Chromebooks, appear to be fans of the new iPad: Apple's iPad unit sales to the U.S. education market rose 32% to over 1 million. The company also reported seeing strong iPad demand from first-time Chinese and Japanese buyers, and noted Walmart Stores Inc. (WMT - Get Report) will be deploying more than 19,000 iPads for employee training. iPad average selling price (ASP) did drop by $54 annually to $436 due to a smaller mix of Pro sales, but given the unit growth, it's hard for Apple to complain. Jim Cramer and the AAP team hold positions in Apple, Broadcom and Alphabet for their Action Alerts PLUS Charitable Trust Portfolio. Want to be alerted before Cramer buys or sells AAPL, AVGO or GOOGL? Learn more now. iPhone units rose 2% to 41 million from the year-ago period's depressed levels, roughly matching expectations. With ASP rising by $11 (a little less than expected) to $606, revenue grew 3% to $24.85 billion. End-user sales were a little stronger than that, given Apple saw a larger-than-usual 3.3-million sequential unit drop in iPhone channel inventory. But more than the June quarter numbers, it's the September quarter sales guidance that bodes well for iPhone sales, as it suggests Apple will record a healthy amount of iPhone revenue towards quarter's end. Particularly since -- as Tim Cook noted on the earnings call -- strong iPhone 8 anticipation is currently pressuring iPhone sales. Considering all the reports to the effect, it's still possible that Apple is facing iPhone 8 production challenges. But the challenges might simply restrict September quarter supplies, rather than fully push back shipments to the December quarter. And it's worth keeping in mind that Apple has also been expected to launch iPhone 7S models that will act as more incremental upgrades to the iPhone 7 and 7-Plus, and be priced accordingly. Apple's high-margin Services business remains a standout: Revenue rose 22% to $7.3 billion, outpacing the March quarter's 18% growth on the back of strong App Store, Apple Music and iCloud storage growth. Another quarter of "strong double digit" growth for the iPhone installed helped expand Apple's services opportunity, and CFO Luca Maestri noted Apple -- aided by new payments deals with the likes of Alipay and PayPal Holdings Inc. (PYPL - Get Report) -- continues seeing strong growth in the number of people paying for things on the App Store. Judging by what was disclosed in Google's Q2 report, rising mobile search ad revenue-sharing payments from Google might also be helping. The Mac, still Apple's second-biggest hardware business, continued to get a lift from last fall's launch of MacBook Pros sporting OLED Touch Bars: Mac revenue grew 7% to $5.6 billion, with units rising 1% to 4.3 million. ASP rose by $71 to $1,303. The iMac and MacBook refresh unveiled at WWDC could provide a meaningful lift this quarter. Strong Apple Watch and headphone demand remain tailwinds for the "Other Products" hardware segment: Its revenue rose 23% to $2.7 billion. Cook disclosed Apple Watch sales rose over 50%, and that AirPods remain supply-constrained in spite of production hikes. As was the case in the March quarter, Apple saw revenue growth in 4 of its 5 regional reporting segments, but not in the "Greater China" region: Its revenue fell 10% to $8 billion amid stiff competition from local Android phone rivals. However, Cook noted mainland Chinese revenue, boosted by iPad, Mac and Services growth, was flat in dollars, and up 6% in constant currency. Hong Kong was said to be the region's main weak spot. But with Hong Kong having long had a large iPhone "grey market" catering to mainland buyers wanting to get iPhones at a discount, softer Hong Kong demand probably reflects some on mainland demand. Cook said official iPhone sales to the mainland were "relatively flat," but it isn't clear if he was talking about units or revenue. Notably, whereas iPhone sales in other regions saw moderate upgrade rates and growing sales to Android "switchers" -- this helped with the installed base growth -- China saw strong upgrade rates and lower sales to switchers. Emerging markets iPhone demand was stronger elsewhere: Maestri reported a number of markets in Asia, Latin America and the Middle East saw 25%-plus iPhone unit growth, and that Apple's total emerging markets revenue grew 19% outside of China. Double-digit total revenue growth was also seen in the U.S., Canada, Germany, Spain, Australia and South Korea. Apple's EPS, meanwhile, got a boost from a 38.5% gross margin -- up from 38% a year ago and at the high end of guidance in spite of surging memory prices. GM is expected to slip to a range of 37.5% to 38% this quarter, something Maestri blamed on both memory prices and initial production costs for new hardware (clearly new iPhones). Earnings also got a boost from $8.3 billion in buybacks. After backing out $153 billion in net cash (most of it admittedly offshore), Apple still only trades for 12 times a fiscal 2018 (ends in September 2018) GAAP EPS consensus of $10.59. And that consensus will probably move higher as analysts react to the June quarter report. With iPhone 8 fears calmed, Services growth still healthy and the iPad for now looking notably healthier, shares might have more room to run ahead of the iPhone 8 launch. TheStreet's Eric Jhonsa earlier covered Apple's earnings through a live blog .